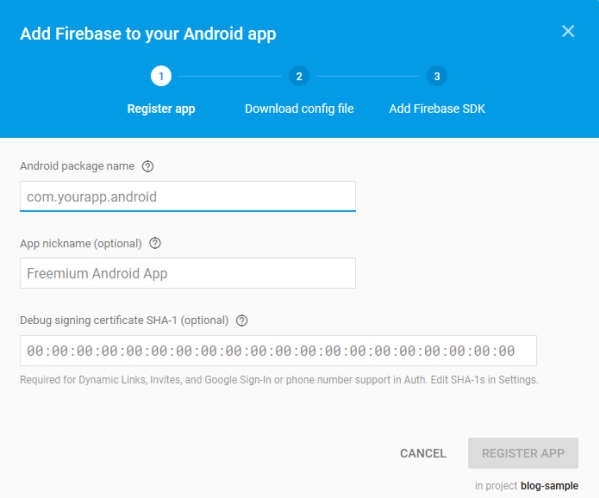 Of course, you first need to create a Firebase application if you don't have one yet. On the project Overview page, you can then click a link to Add Firebase to your Android app. In the dialog you will need to enter your Android package name, which you can find in config.xml file of your Ionic application. It's the id attribute value of the root widget element. tap flag indicating whether the notification was tapped or received directly when the application was open, which allows you to react differently in these two scenarios. Notifications will typically be sent from your application backend using the FCM REST API. For testing purposes you can use any REST client instead, e.g. Postman. 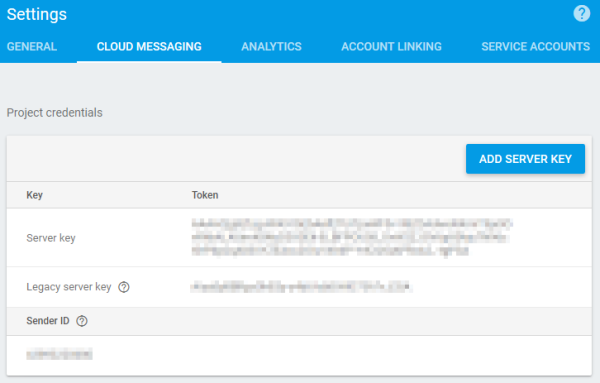 To authorize, you will need to use the FCM Server key, which you can find in Firebase console in Cloud Messaging Settings. Make sure you don't try to use the Wep API Key from General Settings instead, as I did at first. priority specifies, how the message will be delivered to the device. You can check official documentation for details. I've only started implementing FCM and can't yet tell much about the reliability of the plugin I chose. At the moment, it seems the most feature complete of them all and also supports some other Firebase functionalities, not only Cloud Messaging. Google Firebase Cloud Messaging Cordova Push Plugin seems very similar, but is limited to FCM. I also couldn't get the token refresh callback to work, and you don't get the notification title and body in the callback. phonegap-plugin-push was originally written for Google Cloud Messaging (GCM), which is now replaced by FCM. Although version 2.x already supports FCM instead of GCM, I like the other two plugins more because their API maps more closely to the official Firebase client API.